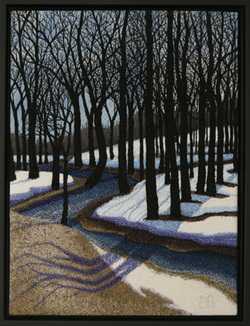 Tracey Lawko is an award-winning quilter, longarmer, embroiderer, and textile artist. Combining her love of traditional needlework techniques with free-motion longarm machine stitching, she creates realistic portraits of plants and the Ontario landscape. Tracey reveals how her textile art has developed - inspired by childhood interests and continual experimentation. As Tracey presents her journey, she invites you to consider your own 'Sources of Inspiration'. "Kaleidoscope" Antique Quilts From the Tannenbaum Collection. Mary has quilts spanning the years from 1974 to the present. Highlights will include older quilts from various family members. The concept of provenance is very important to museum collections. It is the individual story of who made the object, the history of ownership and how it came to be in the museum’s collection. Using examples from the Peel Art Gallery, Museum and Archives collection of sixty historic quilts, the presentation will illustrate why provenance is important and how it is established. "From Inspiration to Art Quilt"
A lecture involving insights about my evolution from traditional quilter to art quilter. Digital presentation plus recent quilts. Elaine Quehl is a Canadian quilt artist, teacher, designer and fabric dyer who is best known for her dramatic and colourful nature-themed art quilts. All fabric used is hand-dyed by the artist to provide the wide range of values she employs to create depth, drama, and contrast, and to read like nature's dappled light. Jennifer uses traditional patchwork and applique to create not so traditional designs. Learn about how she uses the colour wheel to help create stunning colour combinations in her eye catching quilts. As well learn how the use of value is paramount in creating her quilts - light , medium and dark values in just the right proportions. Movement is something Jennifer strives for in her quilts and the use of colour is important in this feeling of movement through the design whether it be from the use of value or secondary designs within the quilt. ﻿The first quilt I ever saw was a Lone star. It was amazing for me to see that you can manipulate fabric in to a piece of art. That was in 1997. That is when I fell in love with quilt art. I come from India with some knowledge of sewing my own clothes and no quilting background. We made our own patterns and still today you do not get any patterns in India. I joined a guild in 1998 and learned this art from my guild programs and quilting books. I travel to India to take care of my elderly parents every year. I used to take some knitting and a good book for my long journey. I started making little “take along kits” to work on in the plane. After returning to Canada I would add some more design elements to finish the quilt top and hand quilt it before my next trip to India. As they say “necessity is the mother of invention”, most of my designs are started as a need to make some part of quilt as a take along projects. Name of my Trunk Show is “Airport Security Stole my Scissors”. That made me come up with ideas to make my take along kits with no need for scissors. My favourite part of quilt making is the challenge of new design and hand quilting. I find hand quilting very relaxing and can get lost in it. Sometime after quilting for few hours I realise that I have not thought of anything and I compare that to Meditation. During the course of the presentation viewers will be taken on a journey of my design process of my quilt projects over the years. This journey will be in chronological order allowing you to observe the development in my skills.